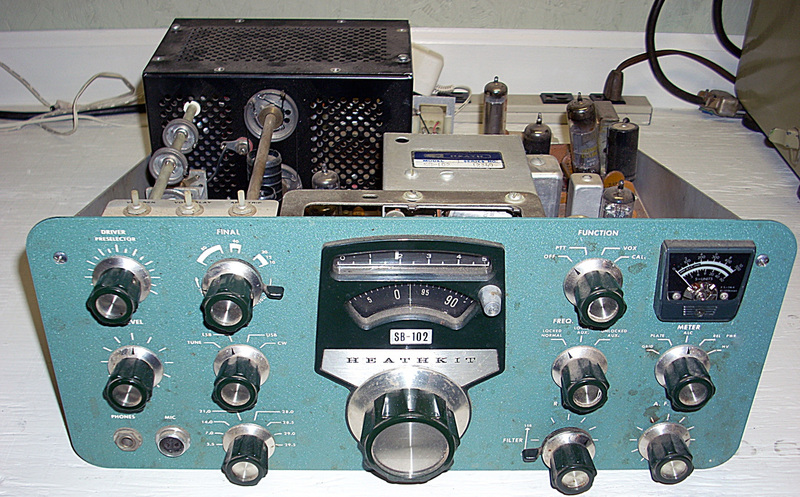 The SB-102 is said to be one of the finest transceivers Heathkit ever produced. 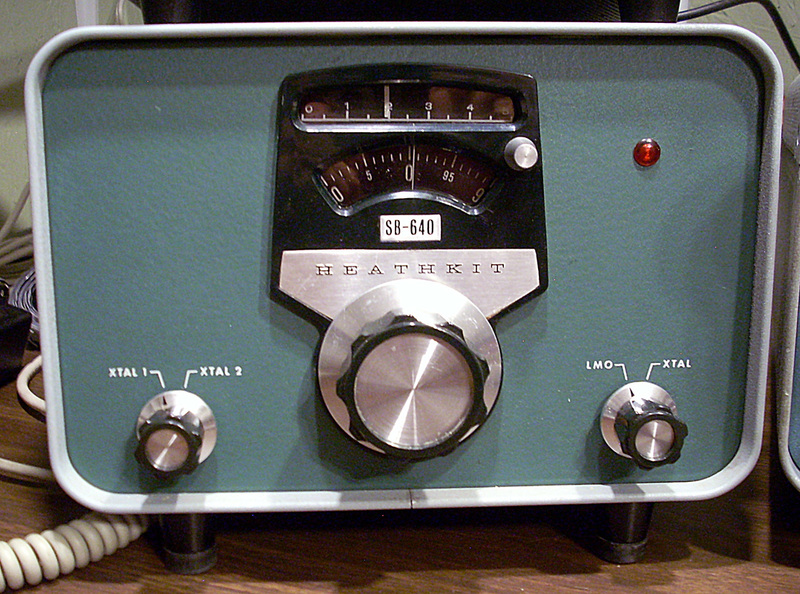 It was Heathkit's last tube-type transceiver and was sold from the late '60's to mid-70's. I came across most of this SB-102 station at an area hamfest. A fellow ham had the SB-102 with original microphone, SB-620 Scanalyzer, SB-640 LMO and the combo SB-600/HP-23B speaker and power supply stashed in his basement for the last 20 years and just wanted to be rid of them, so he sold it all to me for a song. I walked away with a big smile on my face. Only the SB-630 Station Monitor and SB-650 Frequency Display were acquired separately. 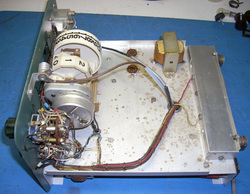 The SB-102 as found with cabinet removed. 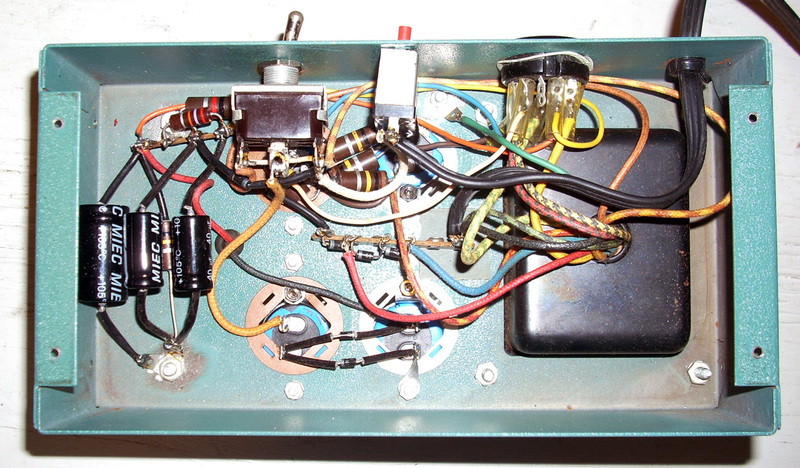 Except for a couple of minor circuit mods for connecting the accessories, it is in original condition and nothing is missing. It even has the optional 400Hz CW filter. 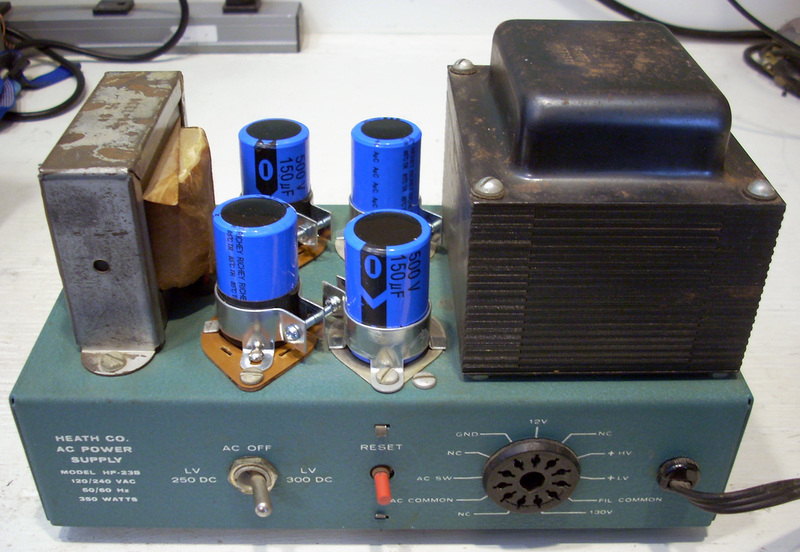 All the tubes tested good, including the 6146's in the final amplifier. There was even a new set of rubber belts for the pre-selector in an envelope inside. 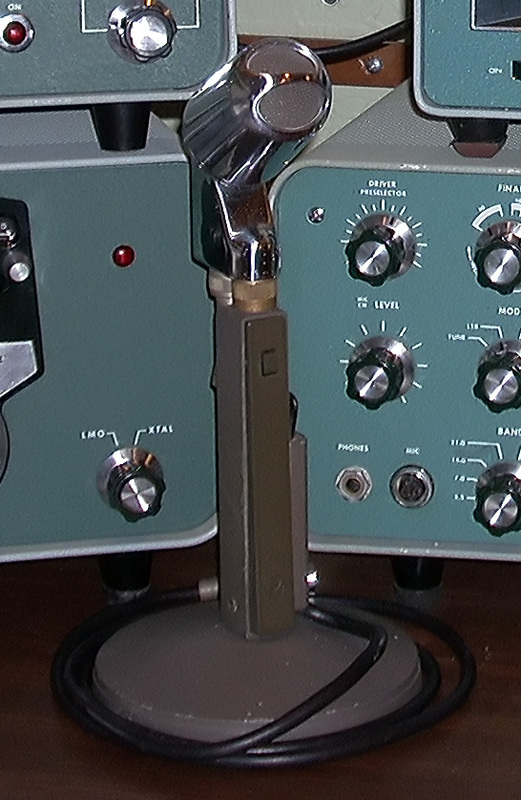 The original microphone is an Electro-Voice Model 638. It had a dented screen so it was disassembled, the dent fixed, and the chrome housing cleaned and polished. The second picture shows some of the parts replaced. 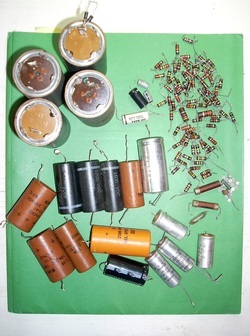 In just the SB-102 over 70 out-of-tolerance resistors were replaced. 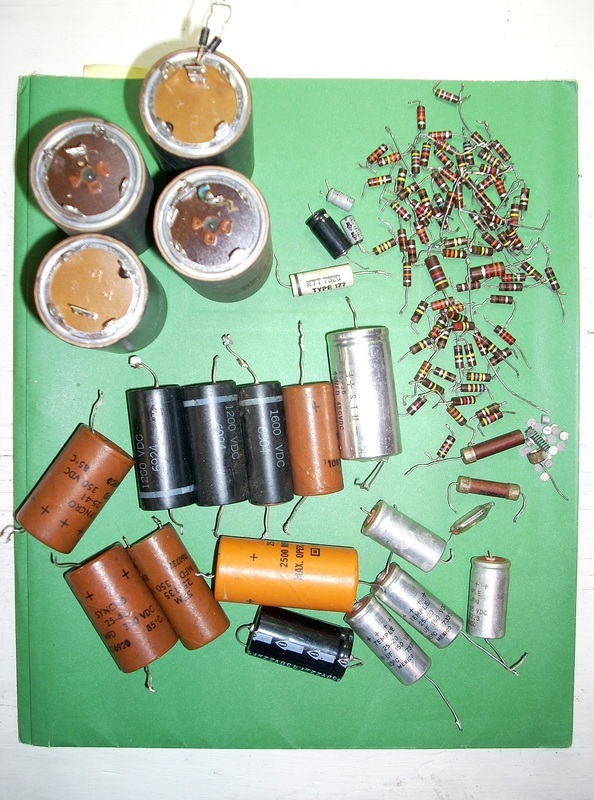 All electrolytics in all units were replaced as well as the selenium diodes and the capacitors in the scanalyzer high voltage power supply. 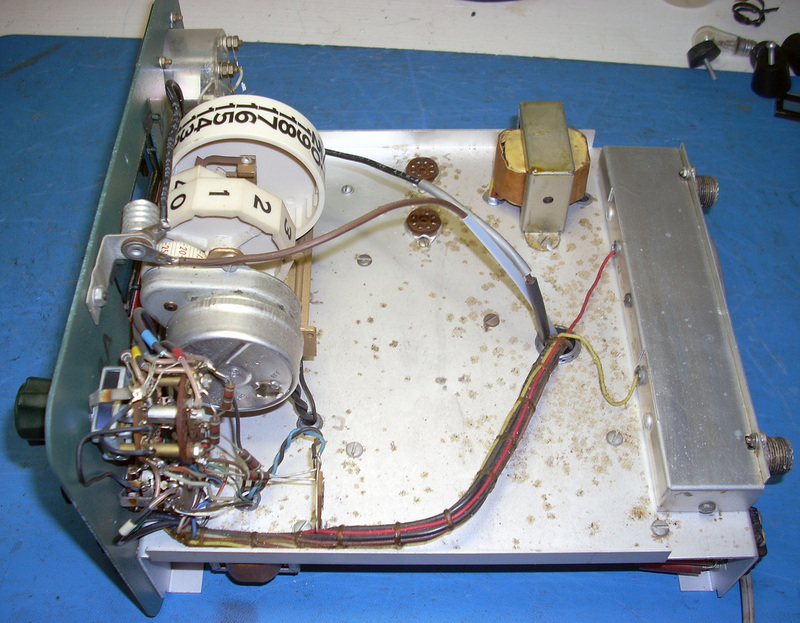 A weak 22.895 MHz crystal in the 102's heterodyne oscillator (14MHz band) was the only crystal that needed replaced. The SB-620 Scanalyzer is a spectrum analyzer monitor scope. 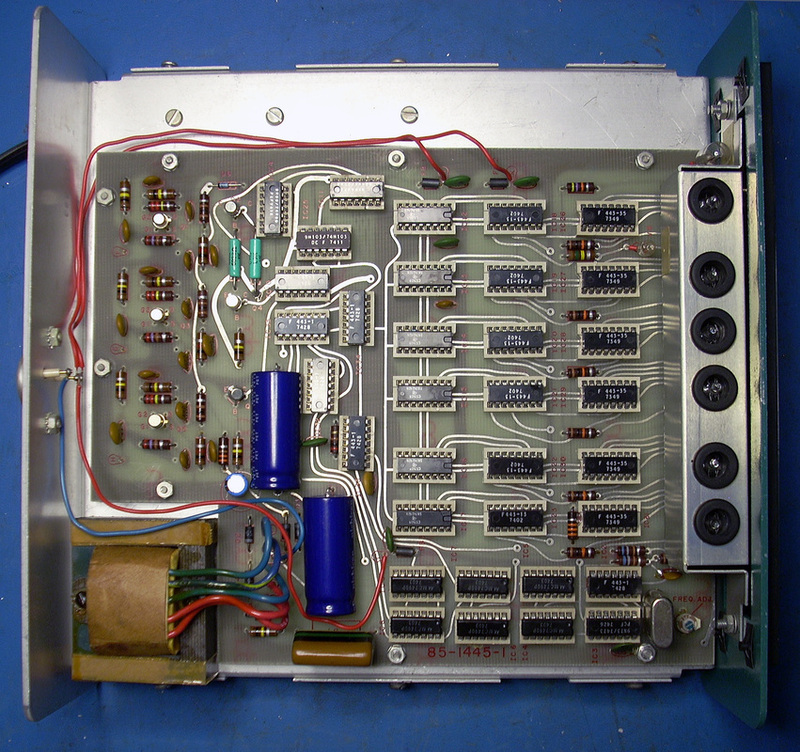 This one has a good bright CRT and after cleaning the unit I rebuilt the high-voltage power supply, recapped the low voltage supply and aligned it according to the manual. 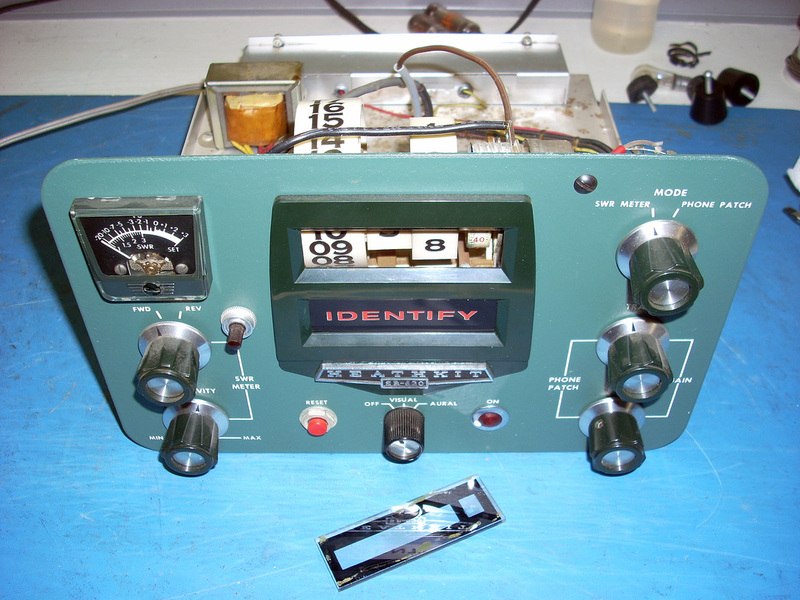 To use the scanalyzer the SB-102 has to be modded per Heathkit's instructions to get access to the IF at the rear panel. The SB-600 speaker also houses the HP-23B power supply for the SB-102. The power supply was completely recapped. 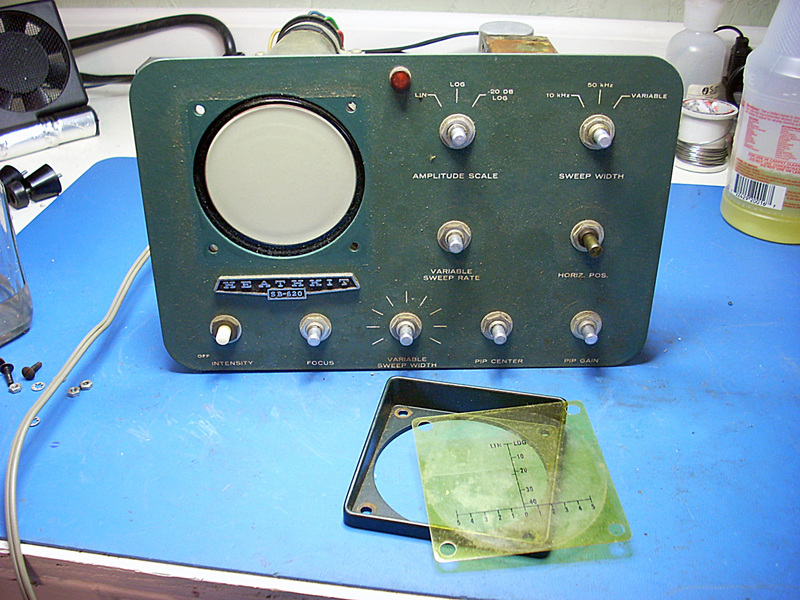 The SB-630 Station Monitor has a very retro looking 1960's digital mechanical clock. It is shown as received and it cleaned up like new. The clock is in good working order but got bounced around in shipping which knocked the plastic faceplate loose. 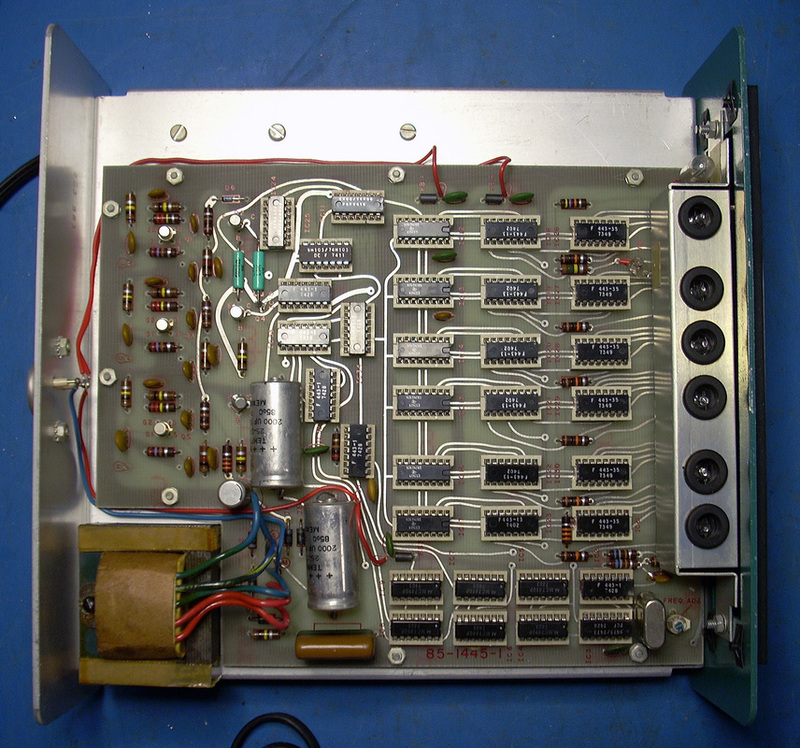 After re-gluing the plate the unit was recapped and out-of-tolerance resistors replaced. Someone in the past added a light and switch for the clock but did a neat job of it. The SB-640 Linear Master Oscillator (LMO) allows for split frequency operation. 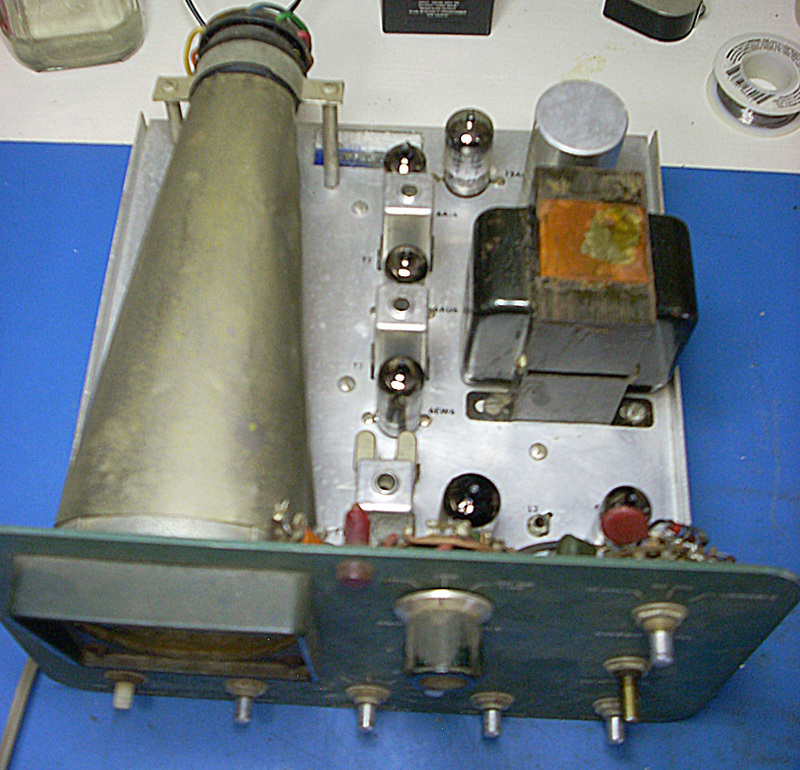 This is a tube-type LMO in contrast to the transistorized LMO of the 102. 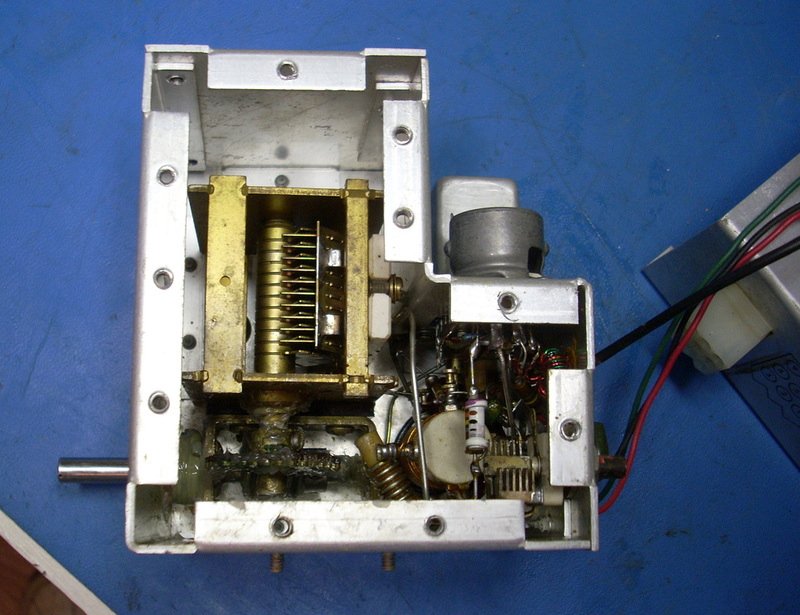 The tuning dial would not budge when I got it so I opened up the factory-assembled LMO assembly to clean and regrease the worm gears. The old grease has hardened into something worse than tar. Speaking of retro, the nixie tube display of the SB-650 is just plain cool. 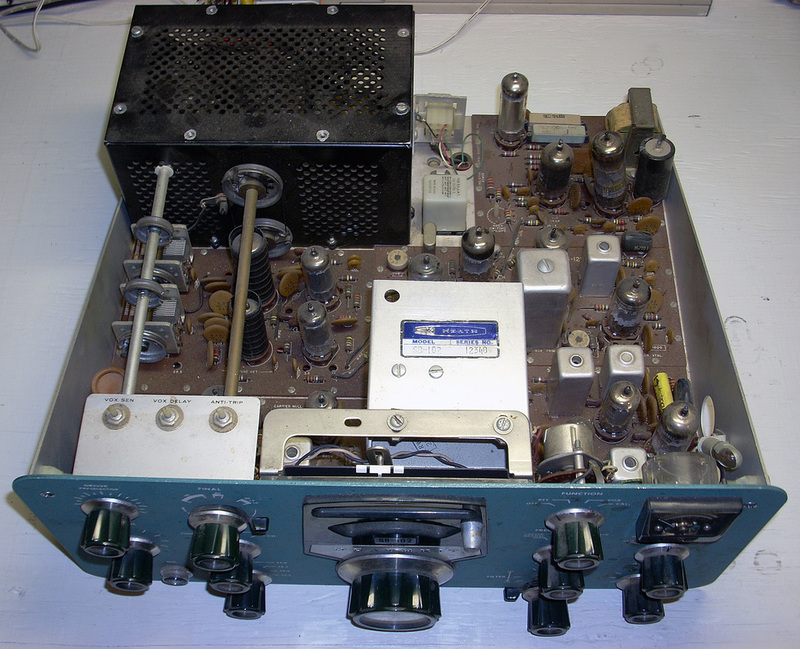 I did have to mod the SB-102 according to Heathkit's instructions to bring the three oscillator signals for the 650 out to the rear panel of the transceiver. I used the two spare phono jacks, re-purposed the ALC jack to avoid drilling any holes, and added a new jack (for the Scanalyzer) in place of the ground screw. The ground screw was then moved over to the lower right of the power plug to another existing hole. The frequency display worked fine as received but I didn't like having 45 year old electrolytic capacitors in it so I replaced them and checked for out-of-tolerance resistors at the same time. A few resistors were at their 10% upper tolerance limit but none were wildly out of spec, so only the three caps were replaced.